The winners of the Plastics Recycling Awards Europe 2019 were announced at the Plastics Recycling Show Europe, held at the RAI Amsterdam in The Netherlands. The seven award winners are: Automotive, Electrical or Electronic Product: Volvo Recycled Plastics Demo Car, Volvo Cars; Building & Construction Product: MPO Easy Channel, Multiport GmbH; Household & Leisure Product: PBD Collection Bag, Cedo Folien- und Haushaltsprodukte GmbH; Plastic Packaging Product: Garçon Wines sustainable 100% rPET, flat wine bottle; Plastics Recycling Ambassador: Gian De Belder, Procter & Gamble; Product Technology Innovation: REC-NIR-Black, Ampacet; Recycling Machinery Innovation: Cascade Extrusion System Corema by Interseroh Dienstleistungs GmbH and Erema Engineering Recycling Maschinen und Anlagen Ges.m.b.H. The winners each received a trophy, with a 3D printed base made from 100 per cent recycled ABS plastic car dashboards and the multi-colour top which is laser cut from compressed HDPE beach clean-up bottle caps. The recycled plastics demo car by Volvo Cars, demonstrates that recycled plastics definitely have a place in the automotive industry. The jury lauded Volvo’s pioneering work in this area: a total of 170 plastic components in this demo XC60 were replaced by recycled plastics. A unique accomplishment and deserved of this award. The MPO Easy Channel drainage system by Multiport GmbH makes perfect sense: made from HDPE- and PP packaging waste, it is lightweight, easy to handle and easy to lay. The jury liked the fact that the material was an ideal fit for the purpose and as result successful in the market. The PBD drawstring collection bag by Cedo Folien- und Haushaltsprodukte GmbH contains more than 90 per cent certified post-consumer recycled (PCR) plastic of which more than 40 per cent is flexible packaging. As well as successfully recycling post-consumer plastic, the collection bag is designed to actively encourage the collection of plastic packaging, metal packaging and drink cartons for recycling. The sustainable, 100 per cent rPET, flat wine bottle by Garçon Wines and RPC M&H Plastics is an innovative mail order wine bottle that fits through letter boxes. This product fits perfectly with the spirit of our times. The packaging combines convenience and cost-effectiveness with a lightweight sustainable design, ticking all the boxes required in packaging today. 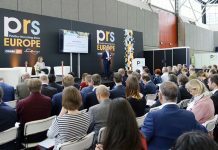 Plastics Recycling Show Europe 2019 – the latest industry updates!